My .qtz file works fine. So I bought QuartzBuilder 2.0 and exported the project ok.
"An unexpected error occurred (error code -10810)"
I cannot find an explanation of 10810.
probably not a QuartzBuilder bug. I don't think an iTunes Visualizer will be of much use with QuartzBuilder, but I could be mistaken. Good point you made: "I don't think an iTunes Visualizer will be of much use with QuartzBuilder" since the .qtz will have to be placed in /Library/iTunes/iTunes Plug-ins in order to work with iTunes. But I am interested in using this as an app too. Thank you for making the effort to explain the error! did a reboot fix it? does the app work on another machine? I must admit the error's a bit opaque, but it hopefully isn't persistent. Maybe there's some information worth collecting (filesystem formats, etc)? 2nd requester: The operation can’t be completed. An unexpected error occurred (error code -10810). Additionally it may be worth mentioning my my .qtz requires: FileTools.plugin; CoGeWebkit.plugin; FreeboardPatch.plugin in order to work. These plugins all show up in the 'Resource Inspector' of QuartzBuilder. Can you make a trivially simple composition and build it into a working app? Can you submit the app (zipped up) to info@kineme.net so they can inspect it? What happens if you pick an app name that's shorter, or has no spaces/special characters (no ')? Great, I removed the apostrophe from the title and the app launched. However, the app then freezes, probably due to the plug-ins, and force-quit is required. Doh, yeah I have an apostrophe in my name O'Connor it always messes things up. I never know when it's ok to use it or not. It's usually an illegal char seeing most computer languages use it somehow. Is your composition referring to Clouds.qtz somewhere? When I run the app built from QB, I get that error plus some seemingly erroneous errors (e.g., KinemeStructureMaker missing). Not sure what's going on there, but try getting rid of the above error and see what happens. If it fails, check Console. Thanks for investigating this for me. I removed the Clouds.qtz reference which was loading in the background on my machine, and recompiled the .app, which runs fine and displays the information, but hangs. The KinemeStructureMaker does not show up in the QB2 Resource Builder Requester, nor can i see a specific reference/plugin/patch in my .qtz file. But I am using the 'Kineme String with URL' patch (which also does not show up in the QB2 Resource Builder Requester). As I said before (correcting myself), I don't need to build an app, I just need to ensure .qtz works as a visualiser in iTunes. I'll zip up what I think will work, including a 'read.me' and send it over. If it works on your machine, i'll test it next on a machine which has no QC installed. Make a new blank composition, that isn't any kind of protocol. Copy all of the stuff that's in your qtz over to that. Rename. Conversely, find the QuartzBuilder template composition. Make a copy of it. Paste all of your stuff onto that. Rename/save. I strongly recommend attempting to use the supplied kineme QuartzBuilder template as your starting point. It should be installed at Developer/Library/QuartzComposer/Templates. All of the starting defaults had a decent amount of time and consideration behind them, it works in 10.5, 10.6, nothing is broken, etc. Note that by default, if you made your Alpha clear value 0,0,0,0 (eg., alpha black), you will see a transparent background. Change background opacity if you don't wish to respect alpha in that way. I think there may be some issue that prevents CoGeWebKit from working inside of QuartzBuilder, but I'm not 100% sure. There is some kind of Web to Image plugin that used to be floating around (I guess you could google for it) that definitely does work though. If I use CoGe WebKit with the stock music vis protocol comp, and build a QB app, open up Console, you can see that CoGe is trying to do some kind of scripting thing that fouls up. That doesn't result in the Finder error for me, but maybe the two are related somehow? When i use the QuartzBuilder.qtz as a starting-point and simply paste my stuff into it and save with a new name and then launch the preview - QB hangs - probably due to the plugins i am using. But not to worry, just see the reply I posted above. The plug-in's I am using (FileTools, CoGeWebKit, Freeboardpatch) provide browser-power, gesturing, and keystrokes inside iTunes! I tried to answer your distribution question as best I could. Let me know if you have issues building a package. Thanks everybody, I appreciate all these tools and your help!!! I don't think the visualizer protocol setting should be utilised in QB at all, merely means you have to have iTunes visualizing;although the Audio Input stock patch can be deployed in such a protocolised comp to replace the (Required) input, it does give a couple of 'rogue' readings on the far end of the spectrum. For a QB app, one that can bundle plugins, I'd have thought that Audio Input from Kineme Audio Tools would be miles better, apart from the CPU hit and the increase in size incumbent upon bundling. After all it gives so much better detail. If you employ the smooth structure js from the visualizer template and transplant into the QB template, then you get the utility value with fuller detail using Kineme Audio Tools. the iTunes visualizer does not get placed in the folder you thought. It goes into your Library/Compositions folder. 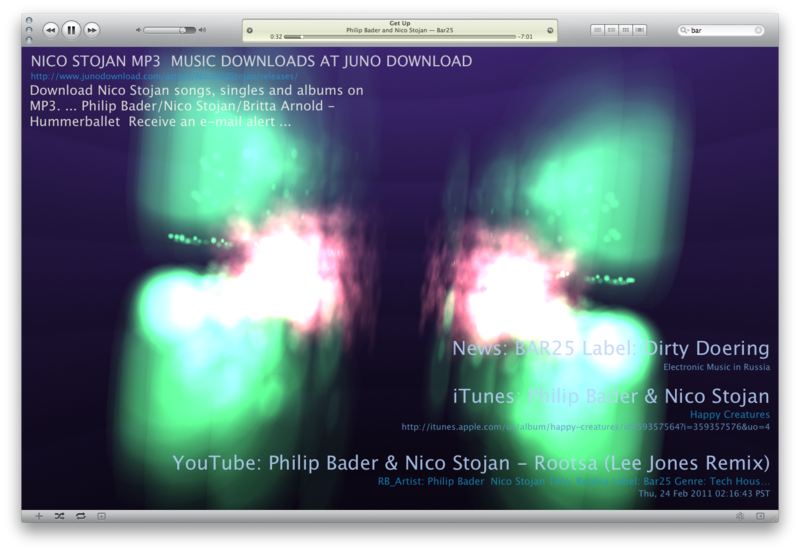 It is the protocol template configuration that makes the .qtz an iTunes visualizer. The only plug in you need is the Quartz Composer Visualizer.bundle that gets automatically installed to the iTunes plugin folder. Kineme Audio Tools are your friend in this case as they can be bundled up by QB and allow for music visualization in QB. See http://cybero.co.uk/Just_A_QC_Blog/2011/01/19/quartz-builder-toys/ for some working examples [10.6 required]. There is also a tutorial about making a visualizing QB toy on the cybero.co.uk site.